Overwatch: Levelling Sideways - What Was I Saying...? Levelling is an odd beast in Overwatch. You can gain levels even in the lowest difficulty "vs. AI" mode and it doesn't provide any mechanical benefit, it just unlocks new skins, voice lines, and that sort of thing. More than anything else, it's a measure of time spent playing the game. Thus, it's possible to grind away to level 100+ and never once compete against another player. I've been thinking about this a bit as I've found a group of players that I've been hanging out with on a semi-regular basis, but unfortunately all they seem to be interested in doing is playing against medium-level AI. That's great when I'm tired and just want to zone out, but it's not exactly challenging. On the medium level, the AI pretty much always run straight to the point in a cluster via one or two predictable paths. Winning an AI match is trivial once you've done it a few times. I've pulled off some fun moves in it, most famously ramming four opponents off the wall and into the sea in Ilios with D.Va's mech, but I'm under no illusions that it was really that skillful a play so much as basic pattern recognition. What the AI mode is really for is learning the mechanics of different characters, so while I've been in that mode anyway because that's where the people I was hanging with are, that's what I've been focusing on. I've also been making a point of exploring the maps and trying to learn where things like healthpacks are, but since the AI always follow the same paths there's not as much incentive to do that, it's just been me thinking forward to improving my actual gameplay later. The net result of all this "practice, practice, practice" is that I'm 32nd level, but I would guess have been in maybe 20 actual (pvp) matches with five or six victories. (There is a site that shows your player stats but I'm not sure how that's broken down. It says I've been in 34 games with an 11/23 win/loss ratio... which doesn't jibe with my memory at all. 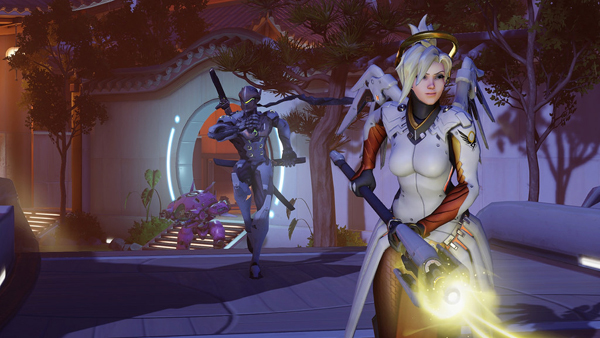 EDIT: An e-mail from Blizzard customer support confirms the stats are from Quick Play games. So apparently I've played more, and better, than I thought!) I hope that the matchmaking algorithm doesn't look at "level" as a stat, because it seems to be pretty useless actually. Anyhow. :) I do still want to get better at the game, and that means actually playing as it's meant to be played. I'm still hunting for some folks to group with in pvp matches, so I don't have to tough it out alone until Dan signs on.